Directions to Stop #2: Walk up the path away from the river for about 50 yards or so. 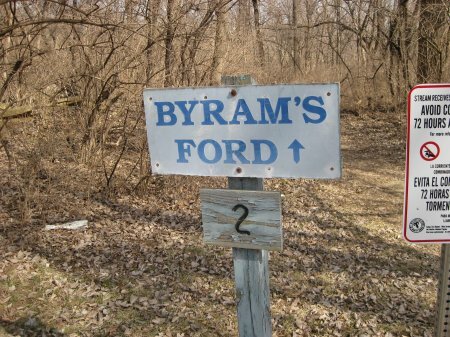 Turn around and face Byram's Ford. This tour stop is located in Kansas City, Missouri 64132. 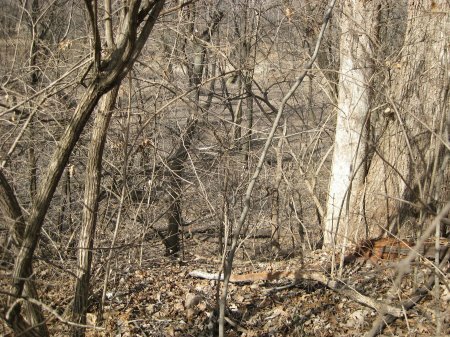 Description: The path on which you are walking follows the approximate route of the old Byram's Ford Road. You are standing in the middle of where the Union defenders (on Oct 22) and the Confederate defenders (on Oct 23) placed their advance skirmish lines waiting to meet the enemy advance. If you walk to the edge of the ridge, you can see that the defenders had a strong defensive position.